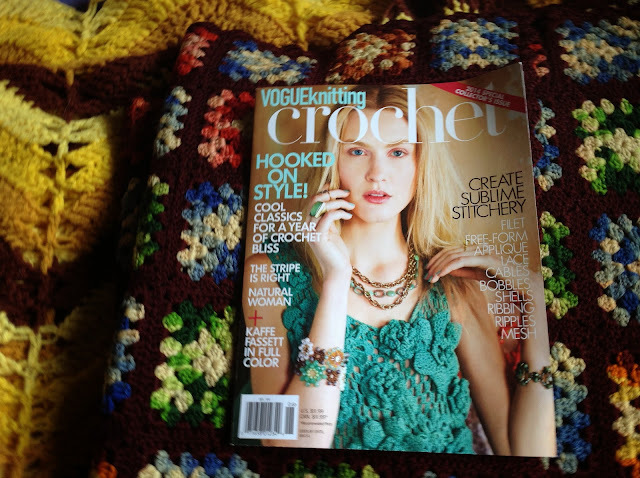 It is hard for me to resist buying crochet magazines. There is SO much great free stuff available online that it makes me feel rather guilty but there were several gorgeous patterns in here to justify its purchase. The cover picture alone with coral-like crochet formations is just SO visually appealing. Kaffe Fassett, incredibly talented with color, has designed a granny afghan (a major weakness of mine). It also contains a stunning horizontally striped cap sleeved top with wedges which I have had on my project list, pinned on my Pinterest crochet board, for soooo long. And finally an article on edgings ideal for two planned projects - bottom hemlines on a plain white a line linen skirt and a dress I love but is just an inch too short.